Before attempting baked-from-scratch brownies, I always used to rely on baked-from-box brownies as a way to please my brownie cravings. For a good part of my life, I thought brownies couldn't get better than the ones that came from the Duncan Hines Chewy Fudge brownie mix. They were so good, and so chewy, and so fudgy that honestly, I thought that non-mix brownies would never live up to that pedestal. So, one day, I drove to the closest Barnes & Noble and I bought 2 brownie books. For this week's 2 brownie posts, I'll only be using 1 of the books. For next week's posts, expect to see recipes from the 2 books I was able to find :) Unfortunately, once again, the humidity/fog took control of my camera's lens and the picture didn't come out very nice, but what can I do? I can't fight with mother nature! 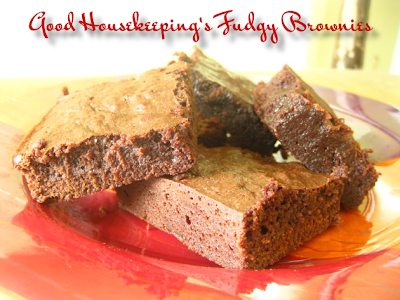 Today's recipe is Good Housekeeping's Fudgy Brownies. According to the authors of Good Housekeeping: Brownies!, "Ultrarich with lots of deep, dark chocolate flavor, these brownies are fabulous with or without the praline topping (Steph Side Note: The praline topping variation will be the next brownie post, so stay tuned!). For a moist, fudgy texture, do not overbake." 1) Preheat oven to 350F. Grease 13" by 9" baking pan. In small bowl, with wire whisk, mix flour and salt. 2) In heavy 4-quart saucepan, melt butter and unsweetened and semisweet chocolates over low heat, stirring frequently, until smooth. Remove from heat. With wooden spoon, stir in sugar and vanilla. Add eggs; stir until well mixed. Stir flour mixture into chocolate mixture just until blended. Spread batter evenly in prepared pan. 3) Bake until toothpick inserted 1 inch from edge comes out clean, about 30 minutes. Cool completely in pan on wire rack. 4) When cool, cut lengthwise into 4 strips, then cut each strip crosswise into 6 pieces. Is it that foggy in Florida? I hope not! I'm going to Orlando in a couple of weeks.